Why is Video Essential to Web Design and Marketing? Why is Video Essential to Web Design and Marketing in 2015? According to Synadcast.com, by 2017 video will make up 74% of all Internet traffic. Because video is visual, auditory, and immersive, it allows viewers cut through the information clutter and understand and experience a topic quickly. Here are more reasons why it should be part of your web design and marketing strategy for 2015. The increased interest in video is due largely to the growth of mobile device usage. As many predicted, 2014 was the year that traffic from mobile devices surpassed traffic from desktops for many websites. It seems users are doing everything on their phones and tablets, from research to shopping. Target recently released its 2014 Holiday numbers showing that 60% of traffic to their site in November and December came from mobile devices. But because of the relatively small screen size of tablets and smartphone, as well as its transient nature, the average user isn’t interested in browsing through pages of text. With video, a greater amount of information can be presented and absorbed in a short amount of time. Syndacast reports that 69% of smartphone users think video is the ideal way to deliver information to smartphone viewers. Visit the video gallery of Ridge Marketing, a web design and marketing agency. YouTube can be a wonderful gateway to reach the more than 1 billion visitors it has per month. But with 100 hours of video being uploaded every minute, the competition is stiff. Other social platforms, such as Facebook, Instagram and Google+, now allow posting and viewing of video, giving businesses more options. And did you know that people are more likely to share online video content than they are to share a text article? SimplyMeasured states that videos on Facebook are shared 12 times more frequently than text posts or links. 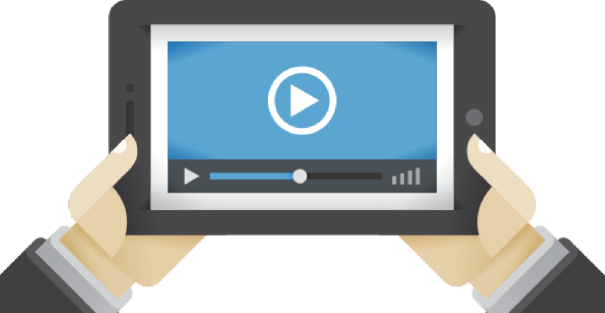 And Syndacast reports that 65% of viewers polled watch more than three quarters of a video once they click play. Creating a video for your company is an investment, but one which will pay off in many ways. On your website, in e-mails or on social media, a video will engage your viewers and convey your message in a compelling way. Because we are a full service marketing agency, we have the staff and skills to handle all aspects of your video production. Please get in touch with us if you’d like to discuss what video can do for you..